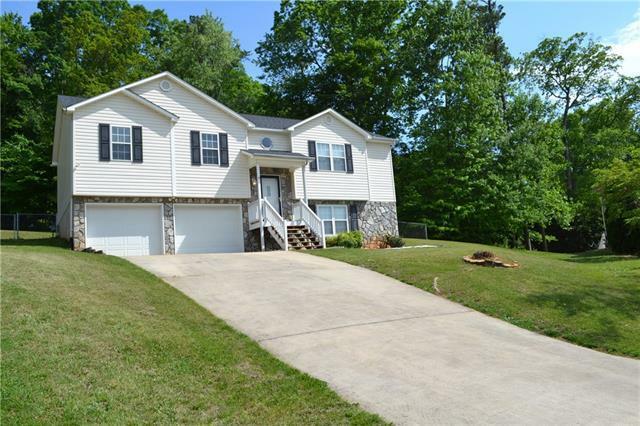 Spacious 3BR/2BA home located in desirable Carriage Hills Subdivision! Soaring ceilings make a grand entrance and opens to large living room featuring vaulted ceilings and gas fireplace. Open concept living, dining and kitchen opens to deck in rear of home. Galley style kitchen with vaulted ceilings overlooks private back yard. Master bedroom on main level comfortably accommodates king size furniture and has a large, walk-in closet. Additional gracious size bedroom with walk-in closet and one full bath are also located on main level. Lower level offers third large bedroom with his and her closet and one full bath with a shower/tub combination. Excellent family room or office on lower level. Double car, attached garage allows for additional storage. Laundry in garage. Fully fenced back yard offers privacy and great outdoor entertaining. Glen Alpine, Table Rock and Freedom School District. City of Morganton water, sewer and waste. Duke Energy. Piedmont Natural Gas.